The Teatro Olimpico, located in Vicenza , northern Italy, was constructed in 1580-1585 AD. The theater is one of three of the world’s oldest surviving Renaissance theaters and is the world’s oldest indoor theater.The Teatro Olimpico is the last work of renowned architect Andrea Palladio. In 1570, Palladio published I Quattro Libri dell' Architettura [The Four Books of Architecture]. This literary work cemented Palladio's place in architectural history. Palladio is widely considered to be one of the most influential figures in European architecture. Commissioned by the Olympic Academy in 1580, Teatro Olimpico was constructed upon the site of a medieval fortress, used as a prison and powder store. Palladio planned the design for Teatro Olimpico in 1579, planning a classically inspired structure using sketches and drawings. Unfortunately, Palladio passed in August 1580, only six months after the construction of Teatro Olimpico started. The sketches and drawings Palladio scribed were used by Vincenzo Scamozzi, a Venetian architect that inherited Palladio’s project. Vincenzo had an excellent starting point with the sketches provided by Palladio, however Palladio never produced designs for the stage floor of Teatro Olimpico. Scamozzi completed this project himself, fashioning a stage made out of wood and stucco. The stage was meant to be temporary, however it survived and remains in the Teatro Olimpico today. There are also two rooms designed by Vincenzo Scamozzi at the Teatro Olimpico, those being the Odèo and Antiodèo, as well as the original entrance “archway which leads from the street, through an old medieval wall into the courtyard of the old fortress”. 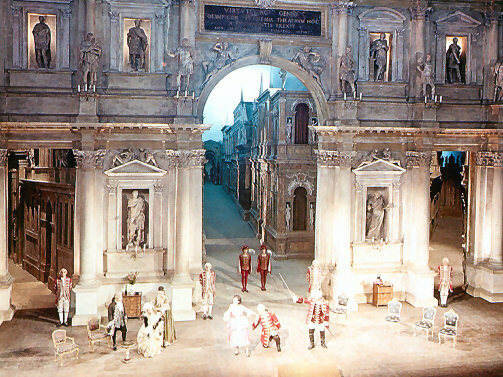 Scamozzi's stage set at the Teatro Olimpico was the first practical introduction of perspective views into Renaissance theatre. The scenery consists of seven hallways decorated to create the illusion of looking down the streets of a city from classical antiquity. The way in which seats in all parts of the theatre were provided with at least one perspective view can be seen by observing the theatre floor plan and following the sight lines of audience members in different parts of the theatre. On March 3rd, 1585, Teatro Olimpico was inaugurated with a performance of Sophocles’ Oedipus Rex. Sadly, only a few more performances took place after that, and then the theater was abandoned. A performance of Oedipus the King took place in 1997 at the Teatro Olimpic using the original lighting by Scamozzi. Today, the Teatro Olimpico still hosts musical performances and plays, but on a smaller scale for conservative reasons of course. Classical plays take place in the autumn and the festival II Suono dell’Olimpico in the spring. Every June, Palladio's Teatro Olimpico is used for the graduation ceremony for students from the American Department of Defense high school in Vicenza. Teatro Olimpico stands to represent one of the most influential architects in the history of European theater, Palladio. Unlike many of its counterparts, the Globe Theater in London, the Teatro Olimpico still stands in its original state. It remains as a significant historic link to the Renaissance stage.